There are several species of Lavender, and they are all different in aroma and effects. Even within the same species, there is regional variation in the aroma and effects of the Lavender essential oils extracted from plants grown in different places. A lot of the essential oil sold on the market as “Lavender” is not what it claims to be. 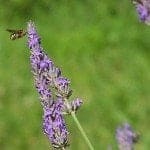 Read on to learn more about why Artisan Aromatics carries six different types of true Lavender and how to choose the type that best suits your purposes, like French Lavender or Bulgarian Lavender or some other. There are a number of different plant species in the genus Lavandula that go by the common name Lavender. There are, in fact, over 30 different species in this genus, and it’s easy to get them confused. The species that has become so well-known in aromatherapy for its relaxing and sleep-inducing properties is now usually referred to by botanists as Lavandula angustifolia. This plant is also known as true Lavender. 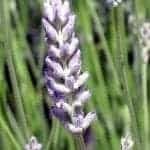 In my opinion this is generally the best Lavender to choose for aromatherapy when you are looking for those classic properties. In the past, the plant that we refer to today as Lavandula angustifolia was known to botanists as Lavandula officinalis and it has also at times been known as Lavandula vera, although some botanists have argued that Lavandula vera should only be used when referring to the plants that grow wild in the Provence region of France. True Lavender is an evergreen woody herb native to southern Europe and the Mediterranean region, tropical areas of Africa, southern India, and the area around modern day Iraq. Fortunately, it is still growing wild in the Southern French Alps in a relatively small area between about 2,200 and 3,600 feet in altitude. These stands of wild plants are comprised mostly of Lavandula angustifolia but invariably contain a few representatives of other wild-growing lavender species as well, including some hybrids of the parent species. The essential oil produced from wild Lavender is sold as Lavandula angustifolia and is also sometimes referred to as population Lavender. In the industry, the names Lavandula vera, Lavandula angustifolia and Lavandula officinalis are generally treated as synonyms and all refer to true Lavender. Just be sure when you buy “Lavender” essential oil to check the botanical name, and never buy any essential oils from companies that don’t provide botanical names on their labels. Lavandula latifolia – commonly referred to as Spike Lavender. This plant is native to the Mediterranean region and still grows wild there, often in the same stands with Lavandula angustifolia. Higher in camphor than true Lavender, Spike Lavender may be stimulating rather than relaxing. Historically, it has been said to assist those with fungal infections and colds/flu through expectorating and antiviral actions. Due to relatively high camphor content, it may be neurotoxic. 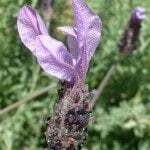 Artisan Aromatics does not carry Spike Lavender in their regular inventory. 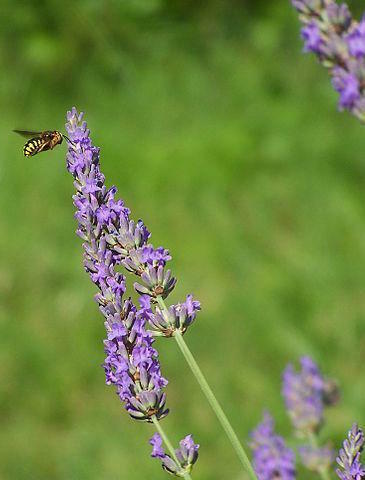 Lavandula stoechas– commonly referred to as Spanish Lavender or Maritime Lavender. Like true Lavender, Lavandula stoechas is native to the Mediterranean area and still grows wild there. 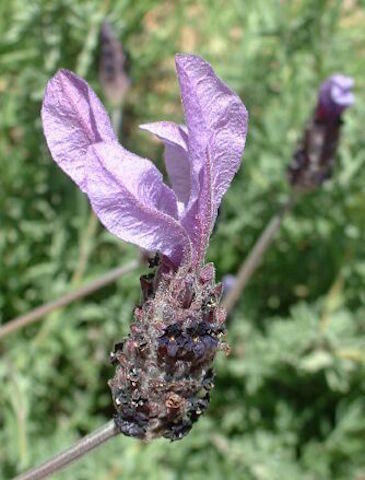 The common name “Spanish” Lavender is deceptive because other species of Lavender also grow in Spain, and this species also grows in other places. Like Spike Lavender, this essential oil is high in camphor and other ketones and may be neurotoxic. 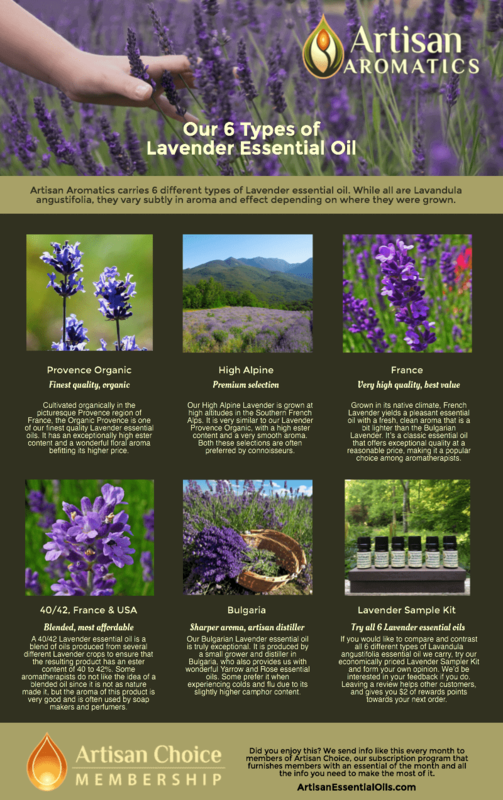 Artisan Aromatics does not carry Spanish Lavender in their regular inventory. Lavandula x intermedia – commonly called Lavandin. This is a hybrid cross of Lavandula angustifolia and Lavandula latifolia. Lavandin is more plentiful and cheaper than true Lavender, and many essential oils offered on the market as “Lavender” are probably actually Lavandin.The effects of Lavandin are similar to those of true Lavender in some respects, but the scent is sharper and more penetrating due to higher camphor content. It also tends to be more stimulating rather than relaxing. In addition, it may inhibit blood clotting and interact with anticoagulant medication. Unlike true Lavender, which has been historically said to heal burns, Lavandin has been said to make burns worse. Traditionally, it has been recommended for colds, flu and other respiratory problems as well as fungal infections of the skin. 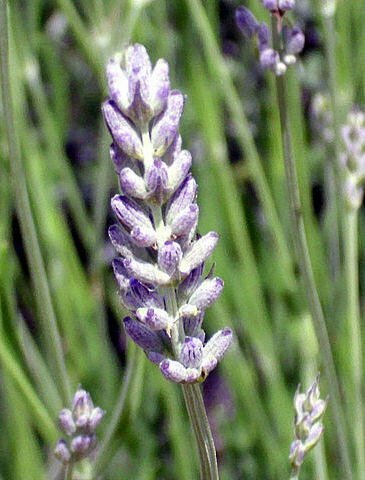 For most applications, true Lavender (Lavandula angustifolia/vera/officinalis) is the Lavender species preferred by aromatherapists because of its relatively higher percentage of esters (constituents that have relaxing properties) and lower percentage of camphor (a constituent with potentially neurotoxic effects). Specialists in aromatherapy sometimes make use of the other species in specific applications, but for the non-professional using essential oils, Lavandula angustifolia is the best choice. As a general rule of thumb, the true Lavender essential oil produced from plants grown in France, especially the wild population Lavender from higher altitudes in the Provence region, is considered to be the very best available because these oils generally have the highest ester content. They are also the most expensive. Some Bulgarian true Lavender essential oils also approach the ester levels achieved by French lavenders. While they are used by many aromatherapists (due to their lower cost), they are often somewhat higher in camphor than French lavender essential oils. The traditional view has been that they are not quite as potent for promoting sleep and relaxation. In my personal experience, I have not seen a great deal of difference between the effects of the Artisan French versus the Artisan Bulgarian Lavenders and have found both to promote relaxation and to be of help on nights when sleep won’t come. The Artisan Bulgarian Lavender is of high quality, and other Bulgarian lavenders will not necessarily give comparable results. Now that you can see the complexities involved in ensuring you are getting the Lavender you want, let’s take a look at true Lavender in more detail. The essential oil of Lavender is steam distilled from the flowering tops, and sometimes the lower leaves are included as well, although this practice yields an essential oil of lesser quality. In many cases, the Lavender essential oils from these other regions do not have a high enough percentage of esters to meet most aromatherapists’ standards, although there are exceptions. The herb Lavender has a 2,500 year history of recorded use and is one of the best known herbs in the world. It was wildcrafted and traded in the ancient world, and was prized by the Egyptians as a perfume as well as in the mummification process. It may have first been domesticated in Arabia, well before the time of Jesus, where it was used as an expectorant and antispasmodic. The fresh or dried flowers and leaves of the Lavender plant were used from very early times as a strewing herb to deodorize and disinfect living spaces. The ancient Greeks and Romans used the aerial parts of the plant to cure or ward off a host of illnesses and eventually Lavender tea became established throughout Europe as a remedy for stomach complaints, nervousness and as a cosmetic water to benefit the skin. Lavender flowers have long been said to repel scorpions, and in France, you still see bowls of Lavender flowers resting on the window ledges for just this reason. The dried flowers and the essential oil are said to repel moths and to help prevent mustiness from mildew, and both are still used in sachets for drawers and closets. The herb Lavender was cited by the famous Catholic abbess and healer, Hildegard of Bingen. It was one of her favorite herbs, and she recommended it for migraine headaches, a use which persisted into modern times, as well as for “maintaining a pure character.” Later, it was one of the major ingredients of the so-called “Thieves Vinegar” used in the Middle Ages during the Plague. It was also highly regarded as an aphrodisiac by some. I have yet to figure out how an herb believed to be an aphrodisiac could help one maintain what a 12th Century nun would consider a pure character! Lavender has also been considered a “witch’s herb” for many centuries and has been said to protect against evil eye, evil spirits and ghosts. In Greek mythology, Lavandula stoechas was said to be one of the plants found in the garden of Hecate, who is regarded by pagans as a manifestation of the Three-fold Goddess. By the 19th century, doctors in the United States and Europe used Lavender essential oil to treat headaches, memory loss, fainting, depression, and infertility in women. Lavender essential oil has been credited by aromatherapists with a large number of physiological actions, some of which seem contradictory. The contradictions make more sense when you know that the essential oil is sometimes considered to have what in herbal medicine is called amphoteric properties. The word amphoteric comes from a Greek word meaning “both”, and in herbal medicine, an amphoteric herb is one that can exert dualistic effects depending on what the body needs. This is why, for example, you’ll see Lavender essential oil described as both a uterine relaxant and a uterine stimulant. Traditionally, the actions of Lavender essential oil have been described in some sources as dose related: 4 drops or less of Lavender producing a relaxing effect, while 5 drops or more becomes stimulating. Although Lavender essential oil was not historically used in ancient Chinese Medicine, it has been incorporated by contemporary practitioners like Gabriel Mojay, Dennis Willmont, and Peter Holmes. Lavender essential oil is considered non-toxic for external use in the small amounts used in aromatherapy (up to 4 drops in a single application). It is non-irritant in usual doses. Lavender essential oil has frequently been considered safe by aromatherapists to use undiluted on the skin, but in recent years, there has been an increase in reported cases of sensitization. It seems wise to dilute Lavender essential oil in vegetable oil prior to topical use (maximum 5% concentrations for application to small areas and 3% or less for application to large areas). Lavender essential oil may cause drowsiness and should not be used by anyone who will be driving or engaging in any potentially hazardous activity. A few years ago, reports were circulated about a study which claimed to show an association between the use of Lavender essential oil and abnormal breast development in boys (allegedly due to estrogenic effects of the essential oil). This study has been widely criticized on methodological grounds and largely discredited. A 2013 study by Politano et al. found Lavender essential oil to have no estrogenic effects in vivo. Essential oils should not be taken internally except under the supervision of an appropriately trained medical professional such as a licensed physician or nurse.